New and pre-owned upright pianos for sale at the Piano Pavilion - large specialist acoustic and digital piano dealership in Essex. All our pre-owned pianos are individual and most cannot be repeated. 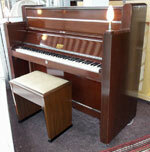 Please call before travelling any distance to try a piano as it may have just been sold. 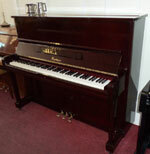 We endeavour to keep this website up-to-date, but availability changes daily and pianos are arriving every week. The pictures and descriptions can help you choose a piano and we are very happy to answer any questions by telephone or email. 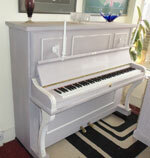 We can accept a deposit against any piano over the telephone by credit / debit card. All prices include delivery within a 40 mile radius and complementary tuning. Please enquire for out of area deliveries. tuned, and the price includes local delivery. and complementary tuning (except for instruments sold at auction).